Starting with an FD, you've got a more complex engine (and turbo) control system, so you got tons of wiring harness plugs and vacuum hoses you need to keep track of (i.e. labelling). Once the engine is stripped down to the short block, it comes apart and rebuild like almost any 13B motor. The hardest part is getting all the parts sparkling clean (carbon deposits are not the easiest to remove!) and checking tolerances. At the same time, since you're reusing your old engine parts, you need to keep track of which seals came out of which hole/groove. The downside to this whole project is if you actually threw out an apex seal (as Jeff mentioned) or cracked the water jacket - this necessitates spending a lot more money for housings! The Mazda factory service manual is a must for all tolerances and torque specs on fasteners. I'd recommend tackling a rebuilt to those looking for a good challange. In the end it's a pretty satisfying experience knowing you've rebuilt YOUR engine by YOURSELF! > in gaskets, I was hoping it would be closer to $500. 54mm = 2-1/8", most of which are 1" drive, so you'll need an adapter. Engines can be broken in on synthetics but generally on not because: during the assembly and initial break in period(scuffing / seating of rings to cylinder bore) contamination and wear particles will be generated. Most people will want to drain this contamination out with the initial oil change and not want to consider the possibility of normal drain intervals or extended drains. However, I personally know of at least several Winston Cup teams that build engines and fire them up on the engine dyno using synthetics from the get go. What is different? They generally are using Total Seal piston rings which do not require the scuffing or seating to occur with the cylinder walls to seal. Restating, if an engine builder wants some 'mating' of sealing surfaces to occur, then my recommendation is to use a quality mineral oil product for the break in period. At that point, usually 3-5 cycles on an engine dyno or 1500 - 3000 miles of street driving, the engines are ready to go. Change to the oil of your choice and down the road you go. In the case of the Corvette, I believe the factory synthetic fill started when the engines where manufactured at OMC (boat builder) in Fondulac, WI. The all aluminum block was of significantly higher tolerances than normally found at GM that in most cases, significant blowby does not occur during the breakin period. The worst thing that can happen with excessive blowby in an engine is 'glazing' of the cylinders. If this happens there is usually only two options. Tear down the engine and rehone the hard glazing from the cylinder walls or use an old drag racing / circle track trick and add Bon Ami cleanser to the old to try and knock the glazing off of the cylinder walls. Marc, if you are unhappy with the oil consumption, replace the Mobil 1 with a GM 4718 approved 10W30 mineral oil for 1500 miles and the rings would come in. Then return to the oil of your choice. Royal Purple is used by Jon Ligenfelter in his ProStock Truck. (Marc know who that is.) We have a 5w30 or 10W30 that meets your warranty requirements for the vette. 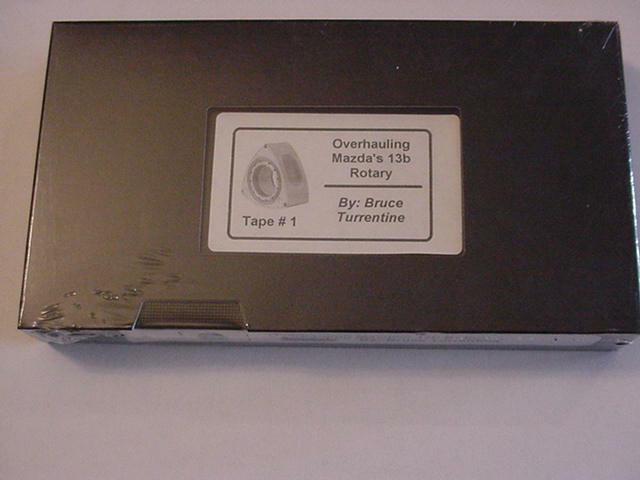 13B engine rebuild tape, 2nd edition, Bruce Terrentine's. Worth it's weight in gold. Best engine rebuild tape I have seen. You could go out and rebuild your own just from this. I saw his first edition, this one (2nd edition) is much better. You can't hurt yourself for ordering it and educating yourself. Contact Turrbie@aol.com for the latest price and availability...! Cost is $29.95 (including priority air shipping). Bruce Turrentine 919-212-00 or 0671, (I can't read my own writing) makes a great video on rebuilding the rotary. Subject: High Performance "O" rings - Success!!!! Looks like the second try on the Teflon coated silicon "O" rings from McMaster Carr was successful. The part number is 9319K239. The Teflon-Encapsulated Silicone O-ring is AS568A Dash No. 175 for $9.94 each. I received the one I ordered and compared it to the Hayes and I can not tell any difference. The Dia is 9" and the thickness is 3/32" and it lays in the groove just like the Hayes meaning you have to work it a bit to get it to stay in the groove and a little Hylomar to make it stick there. So this is a price savings of $15.06 per ring or a $60.24 savings for a set of four over the Hayes O rings. Thanks for pointing to the McMaster site for "O" rings. Yesterday I stopped by Hayes to buy a set of Oil control rings and Oil O rings for my dad for x-mas (SHHH don't tell him :), and had a chance to voice some questions I have been getting from people interested in the O rings, and oil control rings, but not wanting to try and piece together a rebuild kit. Don said he was willing to put together made to order rebuild kits for list members. An example would be the factory gasket set. If you are putting in the Hayes inner coolant O-ring, then you have no need for the OEM inner coolant o-ring which comes with the gasket kit, and is a healthy part of the cost. He quickly jotted down on a piece of paper essentially what the minimal rebuild should consist of. Its likely that its not totally complete as the phone was ringing constantly as he was writing it, and answering phone calls. Anyone putting an engine together with single piece 3mm Ianetti seals would have a more simplified list. If you are rebuilding a third gen engine, you will want most of what is below. Note the apex seal set is $1770, and that is for 3mm 2 piece Iananetti ceramic apex seals, which is a good idea if you like to run high boost. The corner seals are from an 85 GSL-SE, and are the solid type, so they won't break on you like the type with the rubber insert. Subject: Re: (rx7) gaskets needed for changing engine? I saw someone mention a reman gasket set about a week ago. I don't know if something like that exists, they may have put together such a package. If not, I will try to be complete (note that some gaskets that the manual says that you need I am not listing because you very rarely need to replace them - e.g. the exhaust manifold gaskets). I'm posting this public so that, hopefully, and missing gaskets will be caught. You might need an intake elbow to TB gasket. one) you will want to replace the lower intake gasket. New DP / precat nuts. Part numbers I can't help you with (I might be able to get some of them if you REALLY need them, I still have the plastic bags that some of them came in... somewhere). I'm sure I missed a couple, but that should be close to everything. If you have done anything like disconnect the P/S, you might need washers for that, I don't know. Also consider (if you haven't already) getting a set of new coolant lines. Some of them are not easy to get to, generally, and you might as well change them now. I assume that you'll also want (again, if you haven't already) to replace your vacuum hoses. One of your biggest problems is likely to be the wiring harness. They do get very brittle. I bought a new one, not cheap, but I really didn't want to worry about troubleshooting electical problems after I was done. The aluminum side housings exist, and Racing Beat carries them. After each aluminum housing is cast, using A356 Aircraft Alloy, it is heat treated to "T-6" hardness then CNC-machined prior to being flame-sprayed and ground to a final finish. The greatly increased wear resistance is the result of this aerospace originated flame spray (or plasma spray) process that imbeds into the wear surfaces a proprietary carbide material whose durability greatly exceeds that of the nitride surface.... it was not uncommon to find no measurable wear on these housings. We have found the flame spraying process to be so effective that we utilize the process on stock side housings with the same excellent results...."
They list part numbers for the FD as 11051 (front housing), 11061 (intermediate housing) and 11071 (rear housing). Their price list, however, lists a "call" price on the front and rear housings, and $1900 for the intermediate housing. BTW, they list these housings are cast for a peri-port engine; in the pictures there is an outline for the side intake port, but it is plugged - so a port job may be required as well. > seem to find them/ where that was. the eccentric shaft anyway by using one from an older engine. the best sealant is Mazda's Gasket Sealant, P/N 8527-77-739.
has had the same problem. Expect/budget to repair. design discrepancy. Be sure that part number ends in "A" or subsequent. are described as more durable. critical applications may interchange the parts. Just so happens that I work at a nuclear plant, and as a Materials Engineer. (800)480-1212 to find a local distributer.